Wheeler Dealer Slot Machine Review - Casino Answers! Wheeler Dealer is a 9-reel, 8-line slot machine developed by Slotland, featuring a free spins feature and a progressive jackpot. You can play the Wheeler Dealer slot machine at Win A Day Casino. 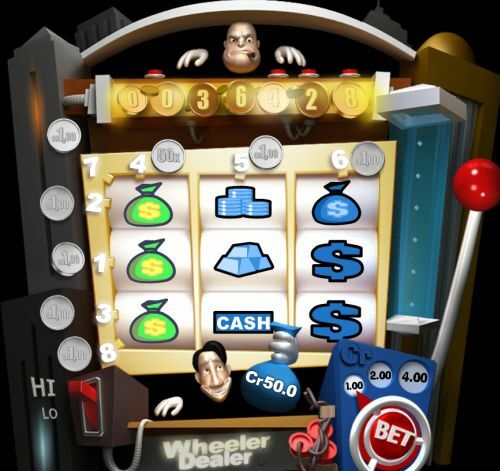 Bets on the Wheeler Dealer slot machine are $0.25, $0.50, $1, $2 and $4. Select the lower wagers by putting the switch to “Lo” or the higher wagers by switching to “Hi.” You can select up to 8 paylines by pressing on the line numbers at the left and top of the reels. The minimum bet you can make on the Wheeler Dealer slot game is a quarter per spin and the maximum total bet available is $32 per spin. Wheeler Dealer has a decent betting range that is most ideal for casual slots players. To play the Wheeler Dealer online slot machine, select your bet and pull the lever. The Wheeler Dealer progressive jackpot slot is linked to a casino-wide progressive jackpot. The current progressive jackpot is at $36,426 and rising with every spin you make! You can win this progressive jackpot by playing the maximum bet and landing 3 Cash symbols. If you are not playing the maximum bet and you land 3 Cash symbols on a selected payline, you will instead win the 1000 coin top fixed payout. The progressive jackpot can only be won in real money mode. To play for the Wheeler Dealer Progressive Jackpot, sign up and make a real money deposit at Win A Day Casino! Whenever 3 or more Diamond symbols appear on a spin, one Diamond is added to the blue vase on the right of the slot machine. Once you have accumulated six Diamonds in the vase, you will win a free bonus spin. Not every free spin will win on the Wheeler Dealer slot game, but the spins that do win may be quite large. The amount won will be based on the amount bet on your previous spin. This is where strategy plays a role on the Wheeler Dealer slot machine – you may want to increase your bet when you are close to winning a free spin! There are 10 winning combinations on the Wheeler Dealer 8-line slot machine. The complete payout schedule is as follows (payouts in parenthesis): 1 Cash symbol (2), 2 Cash symbols (4), 3 Gold Brick symbols (6), 3 Coins symbols (10), 3 Seven symbols (15), 3 Vault symbols (25), 3 Money Bag symbols (50), 3 Dollar Sign symbols (100), 3 Diamond symbols (500) and 3 Cash symbols (1000/jackpot). Wheeler Dealer has a basic autoplay mode that you can use. Click the arrow symbol near the top right part of the screen to open up the autoplay mode options. You will be able to select 5, 10, 25, 50 or 100 autoplay spins. You can speed up the gameplay by skipping animations on winning combinations. Triggering the scatter feature or the bonus game will bring the autoplay mode to a halt. You can stop the Wheeler Dealer autoplay mode at any time by pressing the autoplay mode button. Wheeler Dealer is a fun 9-reel, 8-line slot game. It isn’t packed with special features, but it does have the bonus spin and a progressive jackpot that you can win. You can try out the Wheeler Dealer online slot machine when you sign up and play today at Win A Day Casino! Are players located in the United States allowed to play the Wheeler Dealer slot game for real money? Yes, if you are from the United States of America, you can play the USA-friendly Wheeler Dealer video slot for real money at Win A Day Casino. Do I need to download any casino software to play the Wheeler Dealer casino game? No, there is no casino software to download at Win A Day Casino. You can play Wheeler Dealer for free or real money. For optimum performance, make sure you have the latest version of Adobe Flash Player installed on your computer. How do I win the Win A Day Progressive Jackpot on Wheeler Dealer Slots? To win the progressive jackpot on Wheeler Dealer, you must play the maximum bet and land 3 Cash symbols on a payline. If you are not playing the maximum bet, you will instead win the 1000X top fixed jackpot. You can only win the progressive jackpot when playing for real money at Win A Day Casino. How do I win bonus spins on the Wheeler Dealer slot machine? To win bonus spins (or free spins), you must collect 3 Diamond symbols on the reels 6 times. Your progress is shown in the blue vase to the right of the reels. Once you have collected all 6 Diamonds, you will get a free bonus spin at the same bet as the last spin you made.